Several Arabic treatises dating from the 9th through the 13th century deal with environmental pollution. They cover subjects like air and water contamination, solid waste mishandling and environmental assessments of certain localities. The authors of these texts are well known scholars and physicians: al-Kindi, Qusta b. Luqa, al-Razi, Ibn al-Jazzar, al-Tamimi, Abu Sahl al-Masihi, Ibn Sina, Ali b. Ridhwan, Ibn Jumay‘, Ya‘qub al-Isra' ili, Abdullatif al-Baghdadi, Ibn al-Quff and Ibn al-Nafis. The article surveys this important corpus of environmental ecology and summarizes its contents. Figure 1: Galen, Ibn Sina, and Hippocrates, the three authorities on medical theory and practice in a woodcut from an early 15th-century Latin medical book. (Source). In Antiquity, the physicians studied causes and treatment of widespread illnesses or crowd diseases, both endemics and epidemics, as part of medicine. A handful of books in this field was translated into Arabic during "The Translation Period" of the Arab/Islamic intellectual history (8th to 9th Centuries). Among those were the works of Hippocrates and Galen. Two Hippocrates' works, namely Airs, Waters and Places and Epidemics, were among the most influential works used by the Arab physicians later. This paper reviews a group of Arabic texts that studied environmental pollution as a cause of various illnesses, endemic and epidemic. Its focus is limited to the treatises written solely on this subject, unless the caption issue was treated in depth within some compendium. In addition to the quick review of the contents, we mention any genuine and noble ideas in the treatise. Other researchers before treated this subject briefly; their works are mentioned in the references. But many of the treatises mentioned in this paper were not known when those works were published. This fact leads to some erroneous assumptions, which are corrected below. The issue of health protection against pollution was treated in other non-medical Arabic books. Among those are the "market and industry inspection manuals" (Hisba books in Arabic) and the books of "jurisprudence of civil works", i.e. regulations of civil works and buildings (Ahkām al-Bunyān in Arabic). On Table 1, we list the titles and bibliographical data of the treatises reviewed in this article. The table also shows the year when the author died. Two dates are given: the hijra (Arabic lunar calendar) year and the Gregorian year. The period covered in the paper is up to the end of the 7th /13th century. This is because the Black Death took place in the 8th/14th century and enhanced several authors of that time to write about epidemics and plague. These latter works were studied before . These are recipes of incenses which I extracted from a treatise by Ya'qūb ibn Ishāq al-Kindī to Ahmed ibn al-Mu'tasim [an Abbāsid prince] on making incenses which purge air spoilage. Figure 2: Front cover of the German translation of On Contagion by Qustā ibn Lūqā (Stuttgart, 1987). According to those extracts, the sources of al-Kindī were: (1) books of Sabian or Mandaean sect, descended from the Babylonian star worshippers and (2) Indian books. Hence, the treatise of al-Kindī is about incenses that combat air pollution according to the available knowledge from his sources and experience. Surrounding air differs greatly according to different effects on it. Those are either from the earth or from the sky. The earth factors include: [i] vapors ascending from forests and swamps, [ii] other ground humidities such as the smoke ascending from mountains and furnaces, [iii] other dry bodies which emit smoke when they are burned, corpses and [iv] other spoiled things which emit bad fumes and stinky odors when heated by the sun and nature. Heavenly factors include: extreme heat in summer and extreme cold in winter. These factors cause common illnesses that overwhelm most people. The most obvious cause is air spoilage which results from these factors. Chapter 4: On the diseases arising from the blowing of the different kinds of winds. Chapter 6: On rheum, defluctions and cough, which are caused by a change of weather, and their treatment. Chapter 7: On eye diseases which are caused by a change of weather, by dust or winds, and their treatment. Chapter 8: On the examination of the different waters in order to find out which one is the best. Chapter 9: On the improvement of contaminated water. Chapter 10: On the lack of water and the ingenuity in finding means of quenching one's thirst. Chapter 12: On the treatment of stings and bites of all kinds of vermin . Qustā was a translator who lived during the previously mentioned "Translation Period". The influence of Galen's ideas can be traced in his works . A treatise entitled On Epidemics and Its Causes was ascribed to Qustā . But the study of its content, made by the author of this paper, showed that it is the work of Abū Sahl al-Masīhī, which will be reviewed below. Here we meet another prolific author, especially in medicine. His extant works in the subject of our study are given in Table 1. In his work On Types of Water the subject is treated from the medical, geological and physical points of view. He cites Hippocrates, Dioscorides, Rufus, Galen, Alexander of Tralles, Ibn Māsawaih, ‘Alī ibn Raban at-Ţabarī and Hunayn ibn Ishāq . Figure 3: View from Wadi Hanifa Wetlands, Riyadh, Saudi Arabia. Contrast of the lush lanscape of Wadi Hanifa with the harsh arid landscape of the surrounding environment (Image of ArchNet, 2001). (Source). In his short text Epistle on Chronic Coryza at the Bloom of the Roses, he describes the effect of pollen dust on the respiratory system . Al-Rāzī is well known for being the most freethinking of the major philosophers of Islam. His medical works are typified of being free of dogmatism, following Hippocratic reliance on clinical observations. His criticism of Galen had the potential, in time, to bring down the whole theory of humors and the scheme of the four elements, on which old medicine was grounded . Among his ideas, which appear for the first time in a book is positioning dwelling units uphill and upwind from infected areas . Figure 4: Front cover Māddat al-Baqā' (The Survival Material) by Al-Tamīmī al-Maqdisī edited by Yahya Sh'ār (Cairo, 1999). Ibn al-Jazzār did not travel outside the region of "Ifrīqiya" (today's Tunisia); yet he authored a book on epidemics in Egypt (see Table 1). This made him subject to bitter criticism by the Egyptian physician ‘Alī ibn Ridwān, whose book is reviewed below. Ibn al-Jazzār's work is not extant, except for small extracts quoted by al-Tamīmī and ibn Ridwān. Al-Tamīmī quotes compositions of three syrups that were composed by Ibn al-Jazzār. These syrups were made as health protectors when crowd diseases attack the community. Ibn Ridwān acuses Ibn al-Jazzār of being weak in Greek philosophy, besides writing about an environment that he did not see. He quotes the erroneous statements of Ibn al-Jazzār and then comments on them, one by one. Nevertheless, Ibn al-Jazzār deserves credit for being the first author in the genre of medical geography books, the books that study the environmental conditions of a specific town. This genre include the works of ‘Alī ibn Ridwān, Ibn Jumay', Ya'qūb al-Isrā' īlī, and ‘Abdallatīf al-Baghdādī (Table 1). Some researchers said that Ibn Butlān (d. 458 H/1066 CE) gave a brief description of Baghdad . This "description" is too brief, and does not give any valuable information . Views of Hippocrates, Aristotle and Aharun on the subject. The author devotes special sections to each one of those scholars. In addition, he quotes other non-Arab scientists throughout the book. Description of polluted air types in the Islamic states, and their relations to weather geographical conditions. Diseases resulting from air pollution and their infectious nature. Hygienic procedures for protection against contagion when epidemics occur. Types of incenses which treat/combat air pollution. Many of these were developed by the author himself. Treatment of stagnant water which produces various types of pollution. Drugs which strengthen the immunity system. Here he cites Indian sources, among others. Usage of perfumes, music, and psychotherapy to strengthen the bodies for avoiding infection. Description of smallpox and measles, together with their remedies. Drugs for healing those who caught air born diseases. Many of these were prepared by al-Tamīmī himself . This work of al-Tamīmī was listed among the lost Arabic writings until the end of 1970s , and even the 1980s . Because it was discovered lately, a number of important ideas in it were ascribed to latter authors. Examples are: (i) preventive measures that include sour juices and pickles, ascribed to Tashkupruzāde (d. 968 H/1561 CE) , (ii) methods for improving air quality and increasing body resistance to diseases, ascribed to Ibn Khātimah (d. ca. 775 H/1373 CE) . These subjects were discussed in detail by al-Tamīmī. Figure 5: General view of a rehabilitation work of a traditional mud building in the Draa Valley, Southern Morocco. 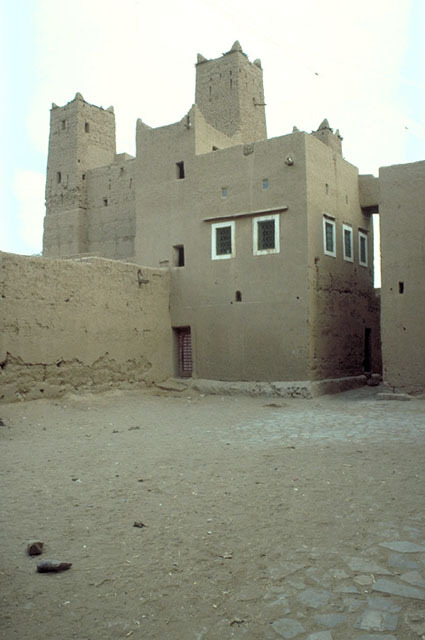 The mud buildings are well suited to their desert environment, only a few small openings appear on the façades for climatic reasons (Image of ArchNet, 1986). (Source). If al-Tamīmī's work is important in its details and pioneering, al-Masīhī is outstanding in being organized and clear. In 19 manuscript pages he presents an "engineered report", classifying crowd diseases in terms of their causes, and specifying a certain remedy for each type of disease. Al-Tamīmī, for comparison, lists many recipes without specifying when and why they are used. Therefore, al-Masīhī ‘s work is a clue to many other works like the one of al-Tamīmī. The treatise is divided into four sections, each one is called jumlah (collection or bunch), as follows: (1) The necessity of air to life, (2) Changes in air contents and the effects of these changes on health. (3) The ways by which epidemics harm the body. (4) Prevention and treatment according to the types of epidemics. In the 2nd section or jumlah we see a clear distinction between endemic illnesses (al-amrād al-bilādiyyah), epidemics (al-wabā‘) and calamity (al-muwatān). Also in this section the author gives three causes of epidemics: (i) Extensive humidity and warmth in air, compared to usual conditions at that time of the year; (ii) extensive dryness in air; (iii) air being changed into an abnormal condition, or when abnormal detrimental fumes are mixed with it. This latter condition causes more calamity. In section 4 the epidemics are classified according to their causes given in section 2. Then he specifies the remedies for each type . Ibn Sīnā's Canon is very important in this subject. Some chapters in it were devoted to (i) moldiness, (ii) types of water, their quality and treatment, (iii) illnesses caused by impurity in water, (iv) air spoilage and its effect, (v) designing houses and selecting their location according to health considerations, (vi) food quality and its effects, and (vii) animals transmitting pollution or observed at the time of plague. He mentions as a sign of an approaching plague that rats and subterranean animals flee to the surface of the earth, behave as if they were intoxicated, and die. This important phenomenon was mentioned by Ibn Sīnā for the first time . Figure 6: Front cover of the edition by Lutfallah Gari of two treatises on environment: Mizāj Dimashq (Temperament of Damascus) by Ya'qūb al-Isra'īlī, and Fī Tahqīq Amr al-Wabā' wa-l-Ihtirāz Minhu Idhā Waqa' (About Investigating the Nature of Epidemics, Prevention and Cure) by Abū Sahl al-Masīhī (Kuwait, 2006). Some of these ideas are treated in depth in another work of Ibn Sīnā entitled Repulsion of Inclusive Harms from Human Bodies (see Table 1). It discusses issues like: (i) Types of harmful air: hot, cold, coal smoke, perfumes, northerly wind, southerly wind, moving from one air to another, epidemics caused by air putrescence, stagnant and moving air; (2) The harms and treatment of water types: forest water, sulfur water, alum water, sulfate water, arsenic water, verdigris water, ammonia water, copper water, tar water, saline water, bitter water, sour water, beer, strong black liquor, light transparent liquor and stored liquor . As we saw earlier, Ibn Ridwān wrote his work to rebut Ibn al-Jazzār. According to Ibn Ridwān, Ibn al-Jazzār was not only a foreigner to Egypt; he also lacked the knowledge of the Greek theory in medicine. Ibn Ridwān was a strong exponent of Galen's thoughts . His treatise contains the following issues: (i) Specific causes of pollution in Egypt (more exactly Metropolitan Cairo), (ii)The temperament of Egypt, (iii) The necessity to adhere to the local environment, (iv) Disturbances and corruption of air there, (v) Causes of epidemics, (vi) Geographical comparison between various parts of Metropolitan Cairo, (vii) Geographical comparison between Metropolitan Cairo and rural areas, (viii) Methods of improving the quality of air, water and food in Egypt, (ix) Appropriate medical remedies to ill bodies, (x) Advantages of living in Metropolitan Cairo, (xi) Emphasis on proper regime and prophylaxis rather than remedial treatment . Figure 7: Title page from Ibn Sina's Canon of Medicine (Source). Here we meet another study of the specific environment of a city. Ibn Jumay' wrote about Alexandria, where he (i) examines the various parts of the city, (ii) conducts field reviews of drinking water sources and how they are polluted, and (iii) studies the types of food and drinks. After showing the shortcomings, he gives the proper advices to eliminate pollution and avoid illnesses. He also gives special advices to the physicians who work in the city . Ibn Jumay' was influenced by Ibn Ridwān, not only in the overall subject, but also in repeating some of the predecessor's ideas. For example, Ibn Ridwān mentioned that "Burqa rams are imported to Egypt. Their transportation creates in their bodies aridity, dryness and humors that are not like the temperament of the Egyptians. For this reason most of the rams get sick when they enter Egypt. After settling down in Egypt for a suitable length of time, their temperament changes and agrees with that of the Egyptians" . Ibn Jumay' repeats the same thing about Burqa rams, but without giving any credit to Ibn Ridwān . 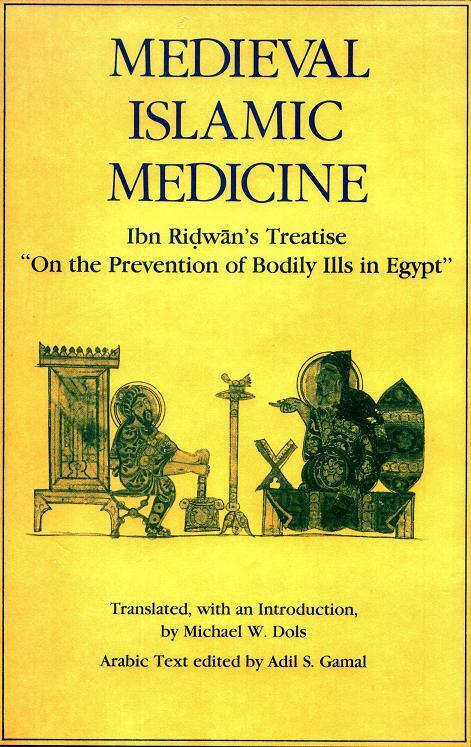 Figure 8: Front cover of Ibn Ridhwan's Treatise On the Prevention of Bodily Ills in Egypt edited and translated by Michael W. Dols and Adil S. Gamal. Berkeley: University of California Press, 1984. Ya'qūb states, in the introduction, that when he visited Damascus in 598 H/1202 CE he was asked several questions. The treatise is composed of the answers to those questions. One of them was about the temperament of Damascus, its location and variation from Egypt (again, the word Egypt here is used for Metropolitan Cairo). It is composed of four "articles" (maqālāt) in 31 pages (Table 1). Only the first article (in 10 pages) is devoted to the question of the environment in Damascus and Egypt. That article is divided into three sections: (i) Presenting the seven climates, and proving that the equator is not a temperate zone; (ii) Egypt's temperament; and (iii) the temperament of Damascus . In his opinion, Egypt is healthier than Damascus, because of the differences in weather and terrain. He , therefore, gives several advises regarding the suitable diet in Damascus, to avoid the common illnesses there . The effect of weather conditions and the rise of the Nile river on the health of people. Here he follows Ibn Ridwān in saying that the people of Upper Egypt are healthier than those of Lower Egypt . The social effects and the behavior of people at the time of crisis. Some researchers thought that he was talking about an epidemic ; while actually he was describing a calamity that resulted from drought and famine . The proper design of houses and city planning. He observed the use of wind catchers or the towers containing ventilation shafts in houses. The Egyptians had firm sewage channels; their streets markets and houses were wide and comfortable . The bath houses were designed with proper ventilation, enough lighting and elevated vaults . 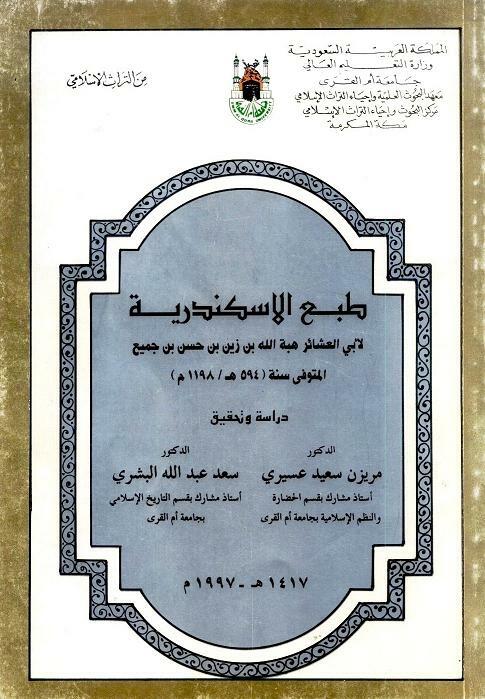 Figure 9: Front cover of Tab'al-Iskanderiyya (The Nature of Alexandria) by Ibn Jumay' (Mekka, Umm al-Qura University, 1997). Ibn al-Quff ‘s work (Table 1) belongs to the literary genre of preventive medicine, as did Ibn Sīnā's work. Other works existed , with less concern about environmental issues. Ibn al-Quff ‘s book is considered outstanding among all the others, being the most comprehensive, finest and most original. It has not been surpassed at the time up to the European Renaissance in its precision, scope, contents and objectivity . Among the subjects of the book are: (1) Water quality and treatment, (2) Causes of epidemics, and (3) Diet and health protection of people according to the terrain and weather in their areas . Ibn al-Nafīs wrote a volumous commentary Hippocrates' Epidemics I & III. But this commentary does not add much new information to the field. In his introduction, Ibn al-Nafīs mentions that his task is limited to explaining the statements of "the Leader Hippocrates" (al-Imām Abuqrāt in his Arabic wording) and justifying his claims. He decided to avoid any lateral issues and arguments against the opponents of Hippocrates, because these controversies were mentioned in other works written by the commentator . The latter authors who cited Ibn al-Nafīs were not influenced by this commentary. They referred to another book of his, namely Summary of the Canon (Mūjaz al-Qānūn) which has a commentary on the important plague description of Ibn Sīnā . Effects of Weather [6, 7, 20]. Some of the authors had genuine contributions to the field. For example we mention those who studied specific localities. Others did not do more than rely on the Greek theory of humors and miasma. For example Ibn al-Nafīs, known in the history of medicine for being the discoverer of the lesser circulation of the blood, wrote two lengthy commentaries on Hippocrates. Reviewing the extant one of those commentaries we do not find anything new. Anyhow, all of the mentioned authors had one thing in common; they were all concerned with environmental pollution and how to protect human health from its effects. M. W. Dols, The Black Death in the Middle East. Princeton, NJ: Princeton University Press, 1977. Al-Tamīmī (Attamīmī al-Maqdisī in the edition), Māddat al-Baqā' (The Survival Material), edited by Yahya Sh'ār. Cairo: The Institute of Arabic Manuscripts, 1999, pp. 177-183. G. Bos (editor), Qusta Ibn Luqa's Medical Regime for the Pilgrims to Mecca. Leiden: E. J. Brill, 1992, p. 5. 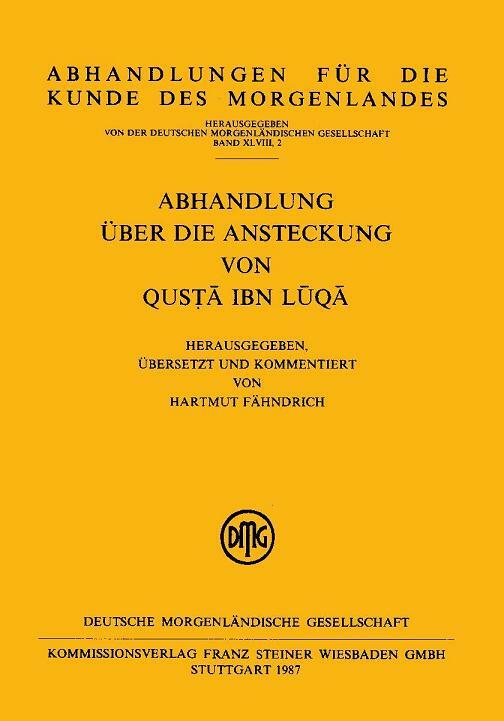 H. Fahndrich (editor), Abhandlung uber die Ansteckung von Qusta Ibn Luqa,. Stuttgart: Franz Steiner Verlag, 1987, pp. 22-24. G. Bos, Qusta's Medical Regime, op. cit., pp. 21-23. M.W. Dols, The Black Death in the Middle East, op. cit., p. 87. Ibid, p. 29; Fuat Sezgin, Geschichte des Arabischen Schrifttums, vol. 3: Medicine. Leiden: E.J. Brill, 1970, pp. 271, 327. Sezgin noted that the treatise cannot be Qusta's, because it was written upon the request of Khwarizm-Shah (the King of Khwarizm) Ma'mūn who died in 407 H/1016 CE, while Qusta died around 300 H/912 CE. F. Sezgin, Geschichte des Arabischen Schrifttums, op. cit., vol. 3, p. 290. Friedrun Hau, "Summary of al-Rāzī's Epistle on Chronic Coryza at the Bloom of the Roses", Journal for the History of Arabic Science (Aleppo: Aleppo University) vol. 1- No. 1 (1977): p. 123. L. E. Goodman, "al-Razi", in Encyclopaedia of Islam (new edition, EI2). Leiden: E. J. Brill, vol. 8 (1995), p. 474. Al-Razi, al-Mansūrī fi't-Tibb (The Mansūrean Book on Medicine), edited by Hazim al-Bakri. Kuwait: Institute of Arab Manuscripts, 1987, p. 225. M. W. Dols and A. S. Gamal, Medieval Islamic Medicine, Ibn Ridwan's Treatise "On the Prevention of Bodily Ills in Egypt". Berkeley: University of California Press, 1984, p. 53. J. Schacht & M. Meyerhof (ed. & trans. ), The Medico-Philosophical Controversy Between Ibn Butlan of Baghdad and Ibn Ridwan of Cairo. Cairo: The Egyptian University, Faculty of Arts, 1937, p. 89. M. W. Dols, The Black Death in the Middle East, op. cit., p. 29. S. K. Hamarneh, Background of History of Arabic Medicine. Amman: Yarmouk University, 1986 (in Arabic), p. 280. M. W. Dols, The Black Death in the Middle East, op. cit., pp. 99, 333. Abū Sahl al-Masīhī, Fī Tahqīq Amr al-Wabā' wa-l-Ihtirāz Minhu Idhā Waqa' (About Investigating the Nature of Epidemics, Prevention and Cure), edited by Lutfallah Gari, Journal for the History of Arabic Science, vol. 13 pp. 5-55. Reprinted in Risālatān fī al-Jughrāfiya al-Ţibbiyah (Two Treatises on Medical Geography). Kuwait: Kuwait University and Kuwait Geographical Society, 2006. M.W. Dols, The Black Death in the Middle East, op. cit., p. 89. Zuhair al-Baba (editor), Min Mu'allafāt Ibn Sīnā at-Tibbiyya, Kitāb Daf' al-Madhār al-Kulliyyah ‘An al-Abdān al-Insāniyya (Some Avicenna‘s Medical Works: Repulsion of Inclusive Harms from Human Bodies). Aleppo: Aleppo University, Institute for the History of Arabic Science, 1984. M. W. Dols & A. S. Gamal, Ibn Ridwan's Treatise, op. cit., pp. 19 & 65. Ibn Jumay', Tab' al-Iskanderiyya (Nature of Alexanderia), edited by Muraizen (Aseeri and Sa'd al-Bishri. Mekka: Umm al-Qura University, 1997. M. W. Dols & A. S. Gamal, Ibn Ridwan's Treatise, op. cit., pp. 90-91. Ibn Jumay', Nature of Alexanderia, op. cit., pp. 69-70. R. Şeşen et al., Islamic Medical Manuscripts in the Libraries of Turkey. Istanbul: Research Centre for Islamic History, Art and Culture, 1984, p. 390; Ya'qūb al-Isra'īlī, Mizāj Dimashq wa Wad'ihā wa Tafāwutihā min Misr (Temperament of Damascus, Its Location and Variance from Egypt), edited by Lutfallah Gari in ‘Ālam al-Makhtūtāt wa al-Nawādir (Manuscripts and Rare Items World, an Arabic refereed journal), vol. 8, no. 2, pp. 428-457. Reprinted in Risālatān fī al-Jughrāfiya al-Tibbiyah (Two Treatises on Medical Geography). Kuwait: Kuwait University and Kuwait Geographical Society, 2006. Ya'qūb al-Isra'īlī, Mizāj Dimashq, op. cit, ibidem. M. W. Dols & A. S. Gamal, Ibn Ridwan's Treatise, op. cit., pp. 92, 193; K. Hafuz Zand and John & Ivy Videan, The Eastern Key: Kitāb al-Ifādah wa-' l-I'tibār of ‘Abdallatīf al-Baghdādī. London: George Allen & Unwin Ltd., 1965, p. 27. Zand and Videan, The Eastern Key, op. cit., p. 7; M. W. Dols, The Black Death in the Middle East, op. cit., p. 33. Ibn Hajar al-'Asqalānī, Badhl al-Mā'ūn fī fadhl at-Tā ‘ūn [About the Religious Virtue of Plague], edited by Ahmed I. A. al-Kātib. Riyadh: al-'Āsimah publisher, 1999, p. 368; An-Nuwairī, Nihāyat al-Arab f Funūn al-Adab (On Varieties of Literature). Cairo: General Egyptian Book Organization, 1992, vol. 29, p. 12. Zand and Videan, The Eastern Key, op. cit., p. 179. S. K. Hamarneh (ed. ), Ibn al-Quff al-Karaki's Book On Preventive Medicine and the Prevention of Health. Amman: University of Jordan, 1989, pp. 12-13. Ibid, pp. 176, 180-192, 216-217. Ibn al-Nafīs, Sharh Kitāb Apidhīmiyā [Commentary on Hippocrates' Epidemics]. Cairo: National Egyptian Library, MS. 583, Tibb/Tal'at, folios 1a-1b. M. W. Dols, The Black Death in the Middle East, 29, 88, 89. Ibn Abī Usaybi'a , ‘Uyūn al-Anbā' fī Tabaqāt al-Atibbā' [Best Selected News about the Classes of Physicians], edited by ‘Āmer an-Naggār. Cairo: National Book Organization, 2001, vol. 2, p. 185. Al-Tamīmī, Māddat al-Baqā', op. cit., pp. 177-183. Friedrun R. Hau, "Summary of Razi's Epistle on Chronic Coryza at the Bloom of the Roses", Journal for the History of Arabic Science, vol. 1 (1977): p. 123. Sezgin, Geschichte des Arabischen Schrifttums, op. cit., vol. 3, p. 289. Yousef Zeedan, Al-Mukhtasar fi'l Hadīth [A Compendium in Hadīth]. With a bibliography of the works of Ibn an-Nafīs. Cairo: Al-Dar al-Misriyah al-Lubnaniah, 1991, pp. 62-63. * P. O. Box 30344, Yanbu al-Sinaiyah, Saudi Arabia. The article was published originally as Lutfallah Gari, "Arabic Treatises on Environmental Pollution up to the End of the Thirteenth Century", Environment and History (The White Horse Press, Cambridge, UK. ), vol. 8, No. 4 (November 2002), pp. 475-488. In the present version, copy editing, images and captions were added (the editor).